Mister Rogers arrives wearing a hat with a crown on it and carrying a toy truck in a box. Before singing What Do You Do With the Mad That You Feel, he suggests that people sometimes use their toys to express their feelings. Mr. McFeely stops by with a videotape showing people using various trucks and pieces of heavy machinery. In the Neighborhood of Make-Believe, Mayor Maggie reports to King Friday that Lady Aberlin has many things at her museum but she is unsure if his crown is among the exhibit pieces. King Friday is invited to go to the Museum-Go-Round but refuses to leave the castle without his crown. He is convinced to do so when Lady Aberlin offers him a cap with a crown on it. Stopping off at the clock, Lady Aberlin tells Daniel that all of the missing things from throughout the Neighborhood are to be returned by Lady Elaine. Daniel joins Lady Aberlin as she goes to the Museum-Go-Round where everyone else is waiting for their things to be returned. Everything is reluctantly returned to its rightful owners except King Friday's crown which floats around the musuem out of everyone's reach. Finally, the crown finds its way to King Friday's head and everyone is invited to celebrate in the castle's C Room. Back at the house, Mister Rogers is visited by Bill Nye the Science Guy. With a bottle, vinegar, and baking soda, Mr. Nye demonstrates how to blow up a balloon without using your mouth. Bill Nye was the host of Bill Nye the Science Guy which aired on PBS from 1993-1998. 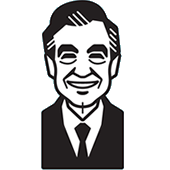 This episode is dedicated to Johnny Costa -- longtime pianist for Mister Rogers' Neighborhood. 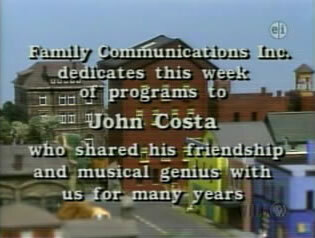 Mr. Costa died on October 11, 1996. This episode is included on the DVD Friends and Feelings. © 1997 Family Communications, Inc.